Gardening is a great way to get your children interested in nature, and the positive long-term effects on health are an added bonus for both you and your kids. If you’ve been considering getting your kids involved in gardening and are wondering what type of jobs or equipment would be good for them, then here are some tips to keep them interested, safe, and enjoying the splendor of the natural world. While gardening isn’t considered a dangerous activity, it does require equipment that can be dangerous if not handled properly. The best way to ensure that your child stays safe while working in the garden is by purchasing them age appropriate equipment. For young ones, most garden centers will sell plastic tools, and as your kids get older they can upgrade to wooden ones and then regular metal tools. Be sure to always supervise your kids when they’re using any sharp objects. The best way to prevent your kids from using tools they shouldn’t be touching is by storing them in a locked space like garden sheds. Most kids like getting dirty and playing in water, so to get yours interested in spending time in the garden consider involving them in things like laying soil in the flowerbeds or watering the plants. As kids start to become more interested in spending time in the garden you can slowly teach them about it and introduce them to other chores and activities. 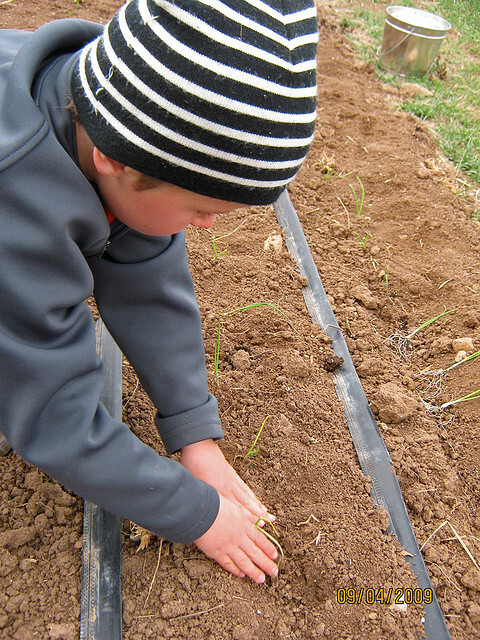 Gardening is a great way for your kids to learn responsibility, and by putting them in charge of a specific task in the garden they will quickly understand that their work directly effects the productivity of the garden. Start by putting them in charge of something simple, and then gradually they can build their way up to more and more difficult tasks. The sense of responsibility and ownership is directly transferable to other parts of their lives. The garden is an ecosystem, and the bugs that live there are an important part of it. Teaching your kids about the insects living in the garden and their role in helping it to stay healthy and grow is a valuable concept for both their work in the garden and life in general. You don’t have to be a natural green thumb to enjoy your time in the garden and turn the space into a family fun environment. Image by Jessica “The Hun” Reeder used under the Creative Commons license. This entry was posted in Living and tagged gardening.